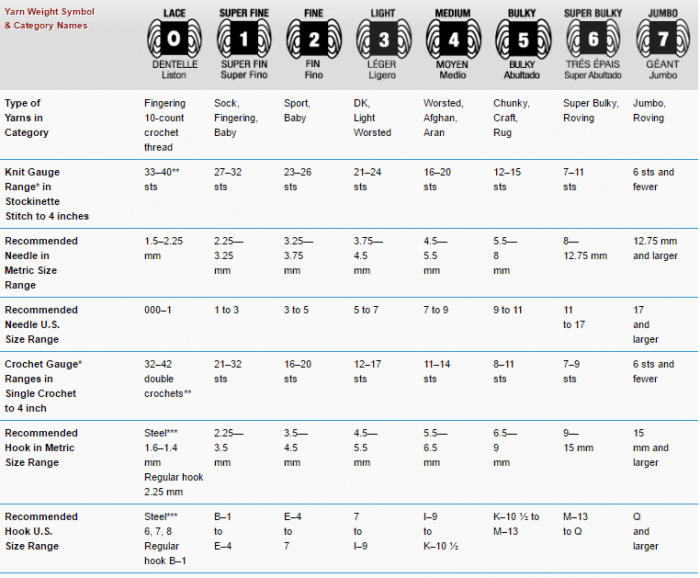 * This chart is a guideline only and reflects the most commonly used gauges and hook sizes for specific yarn categories. ** Lace weight yarns are usually knitted or crocheted on larger needles and hooks to create lacy, openwork patterns. Accordingly, a gauge range is difficult to determine. Always follow the gauge stated in your pattern. *** Steel crochet hooks are sized differently from regular hooks — the higher the number, the smaller the hook, which is the reverse of regular hook sizing.